On April 19, 2011, the US Mint began sales of the latest numismatic product for the America the Beautiful Quarters Program. The ten coin set includes uncirculated versions from the Philadelphia and Denver Mint for each of the five designs issued for 2011. Each year, five different National Parks or other national sites are represented on the reverse design of the quarter dollar. The sites are presented in the order that they were federally designated. On the obverse of the coin is a portrait of George Washington designed by John Flanagan for the introduction of the Washington Quarter in 1932. 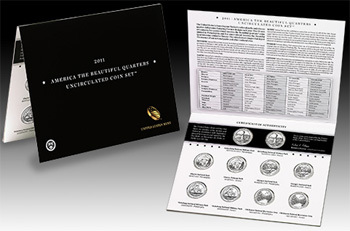 Coins included in the 2011 America the Beautiful Quarters Uncirculated Coin Set feature a “brilliant finish.” This type of finish was reintroduced this year, with the previous “satin finish” used for the 2010-dated set, which remains available for sale.